Governments across the globe are setting targets for reducing their carbon emissions. For example, the UK Government has committed to an eighty per cent reduction by 2050, when twenty-eight million buildings that currently exist will still be standing; this represents a challenge to improve the energy efficiency of more than one building per minute between now and 2050! This is a problem that needs tackling worldwide and is a challenge to both the refurbishment sector of the global construction industry and to those who own and operate existing buildings. 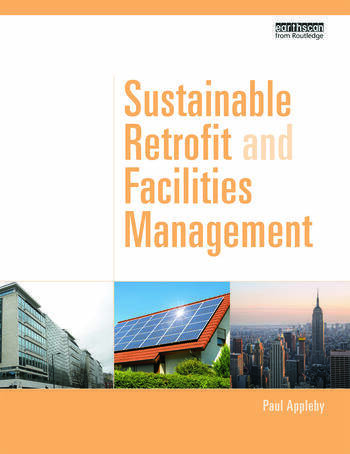 Sustainable Retrofit and Facilities Management provides comprehensive guidance to those involved in the refurbishment and management of existing buildings on minimizing carbon emissions, water consumption and waste to landfill, along with enhancing the long term sustainability of a building. Practical guidance is provided on measures that can be used to improve the efficiency and sustainability of existing buildings, through both good management and refurbishment. Also explored is the relationship between the refurbishment of existing buildings, facility management and the wider community infrastructure. The book looks at management tools such as post occupancy evaluation, building health checks, energy management software, green building management toolkits and green leases. Illustrated throughout with case studies and examples of best practice, this is a must-have handbook for engineers, architects, developers, contractors and facility managers. Paul Appleby advises design and masterplanning teams on the integrated sustainable design of buildings and communities. He has recently been appointed as a CABE Built Environment Expert for the Design Council and has worked in the construction industry as a consultant, lecturer and researcher for over 40 years, working on award-winning projects with some of the world's leading architects. As well as writing key guidance published by CIBSE, his book Integrated Sustainable Design of Buildings appeared in a list of Cambridge University’s ‘Top 40 Sustainability Books of 2010’. He has spoken at numerous conferences and seminars worldwide. He was listed as a ‘Green Hero’ in a list published by Property Week. Paul’s books about sustainable design need to be open on our desks, and not just shelved in libraries. With Sustainable Retrofit, and Facilities Management, Paul has closed a gap with a clearly written, and well-illustrated guide, plugging us into the detail and solutions towards mitigating environmental impact of our current and existing building stock.